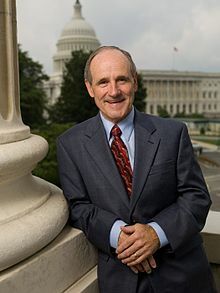 Jim Risch (born 3 May 1943) is an American Republican politician, rancher, and attorney from Ada County, Idaho, currently serving as the junior United States Senator from Idaho. He previously served as the 39th and 41st Lieutenant Governor (2003–2006, 2007–2009) and the 31st Governor (2006–2007) of Idaho. [On the victims of the hurricane Katrina] "Here in Idaho, we couldn't understand how people could sit around on the kerbs waiting for the federal government to come and do something. We had a dam break in 1976, but we didn't whine about it. We got out our backhoes and we rebuilt the roads and replanted the fields and got on with our lives. That's the culture here. Not waiting for the federal government to bring you drinking water. In Idaho there would have been entrepreneurs selling the drinking water." This page was last edited on 25 May 2017, at 18:45.